Dogged tacking. Michael and Liam push on with the seemingly enormous area of wall needing to be covered with plasterboard. (Reuben points out that the painting needed is considerable – and it’s planned that we do this ourselves.) 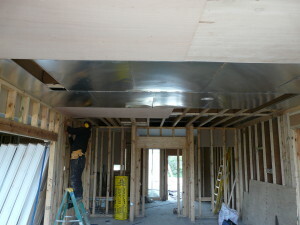 Insulating plasterboard is used on the external walls – indentifiable by the reflective foil on one side. 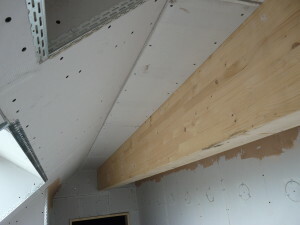 Internal walls, which will also be filled with Warmcel but for its acoustic properties as much as anything, need only use standard plasterboard. The remaining doors have been fitted. 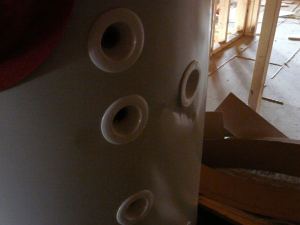 To allow the ventilation system to work, the top of the door linings are routed out to provide an air passage. As the MVHR draws air out of the kitchen and bathrooms air has to be able to move into these rooms from adjoining rooms whether the doors are open or not – and, similarly, air blown into the living and bedrooms needs to have somewhere to go. The gaps are invisible. So the whole house is continuously ventilated very much better, it seems, than most houses. The windows do not have trickle vents! The big windows have been fitted – or rather, the glass doors in the windows have been fitted. Even these take 3 people to lift them – and are, amazingly, hung on just two small hinges. The house has suddenly become quiet. Now that we have plasterboard in the utility room and control room – to which pipes can be clipped – Simon King, the plumber, returns to replace the temporary water main with the final, full sized one and to build the hot and cold distribution manifold. All the isolation valves – the easy to operate lever type – are therefore in one place. Another rush of progress, but in curious fits and starts. One moment the site is full of activity, the next there’s hardly anyone here doing anything. We’ve made it clear that we’re not aiming for a particular date, so we cannot really complain if people have to go to do other jobs. Touchwood Homes, we know, are working on other buildings, though there’s a concern that the big windows have been standing outside now for quite long time. They need five strong people to move them, being very heavy, even after removing the doors from them. Reuben worked out that they can be got into the house past the scaffolding after all, but there can be no mistakes. During the first of these two weeks, the downstairs ceilings have been covered with plasterboard, drilled to allow the Warmcel to be blown into the void, the holes filled and then all the ceilings plastered (see last post’s picture). This allowed the tilers to start work and during this last week all the downstairs floors have been tiled except for the areas immediately in front of the big windows (as they’re not there, the exact position of the edge is not known). Suddenly we could see what the house could look like – and were immensely relieved that the colours we’d chosen looked OK. We need tiles on the ground floor for thermal mass – not (just) in themselves, but to provide good thermal conductivity to the concrete slab beneath. If we covered the floor with carpet, this would insulate the slab from the room and the thermal mass would be ineffective. 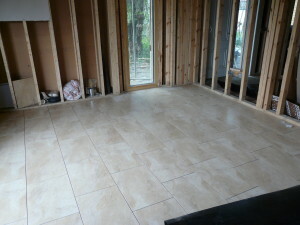 The tiles on the utility room, kitchen and pantry have also been grouted. The grouting of the paler tiles (and paler grouting) will be left until later as it could get stained. We have now (Friday before the BH weekend), covered the entire ground floor in Correx, a corrugated plastic temporary covering, to protect it and particularly the un-grouted porcelain tiles against chipping. 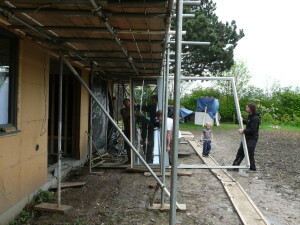 On the Saturday, the 5 strong men arrived and got the windows into the house. 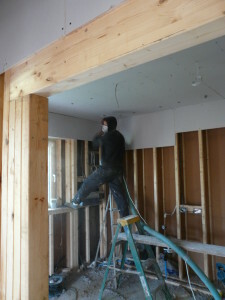 While the tilers have been working downstairs, the plasterers have “tacked” upstairs. And carpenters have been applying more Thermowood cladding outside. The west gable end if complete and the east end coming along. The horizontal lines of the cladding have changed the look of the house from this view – it looks less tall. The garage has got its roof. 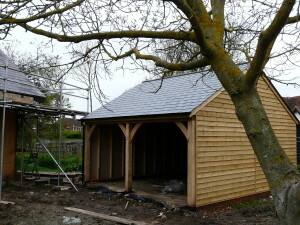 And finally the garage (aka cart barn aka carriage house) got its slates. And a quiet day when I could catch up with this blog! Two very hectic weeks. 16 sheets of 3 ply appeared. These are for the soffits of the deep overhangs—please paint them—one side only. This seemed to be just the job for spray painting. Lean them up against the black barn wall and any over-spray only adds to what’s there already. (Almost) needless to say, by the time we’ve got everything ready it’s become far too windy, so back to the brush. But, blessed with dry weather, we put the first coat on (thinned) in an afternoon leaving them out to dry on the grass, and the following day we put the top coat on. By the end of the day they’re dry enough to stack. Last week was also plumbing 1st fix. Simon went through the house with amazing speed. Plumbing is almost entirely in PEX, a pipe with plastic inner and outer separated by a layer of aluminium—a layman’s description anyway. This makes it flexible, and therefore much easier to install than copper would be—holes can be drilled in the I-beam webs and the pipe pushed through. This contrasts with the ducting where pre-cut holes, included in the structure design have eased the installation of the rigid ducting. It’s easy to see that using rigid copper piping would have been extremely difficult. Everything has been brought to cxommon point in the control room where a manifold will be installed, so there are no joints anywhere in the floors or walls. The thought of soggy Warmcel is terrifying. Then it starts getting pretty exciting. For dealing with the thermal store damage there were two options. Either have a new one—with a consequential delay of 5 to 6 weeks—or have the damage repaired. We’ve accepted the latter—it is, after all, cosmetic. Most of the work was done in a day and then internal work stopped for a day so that spraying could be done in a dust free atmosphere. Feel sorry for the Clancy–Docwra people connecting the mains water. Day 1: the traffic lights arrive and initial holes dug. It seems that it’s a 6 inch main not a 4 inch one, so the fittings are wrong. Day 2: all goes well until the end of the afternoon when the main breaks—water everywhere. Suddenly there are a lot more people around—and I fear we may not be popular with the neighbours—no water for a few hours. Day 3: fill in and go away. Day four: there are still traffic lights there, causing annoyance at school times—but after a telephone call or two, by the end of the day they’ve gone. Touchwood Homes have been at the Ecobuild exhibition, so there has had to be a short pause and I would hope that next week the skylights can be fitted with their flashings. (We spent a day there too, but with most decisions made our enquiries lacked the urgency of last year.) It should then be possible to complete the roofing. The Optiwin windows also arrived. The ones for the front look incredibly large and are very heavy. 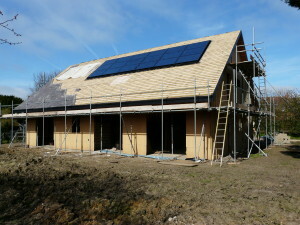 The solar thermal panels have been installed—and covered against the sun. (We may need rain—but we’re also glad that it’s not raining when it comes to work on the roof). 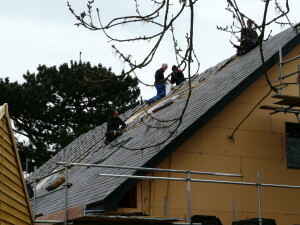 The slates have arrived—second-hand Welsh slates—and the roof loaded and—by the end of week twelve, partly slated. 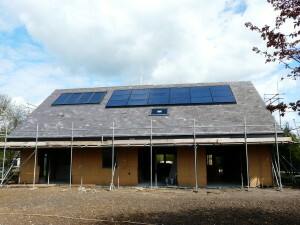 Matt and his team have been inter-working with Jonathan and his team installing the solar panels. Everyone seems to be working in with each other very well, and long may it continue. Not than nothing happened during week nine, but most of it’s happening indoors and photos aren’t very satisfactory. It’s a bit dark, because the whole roof is now covered with the cladding, even the places where the roof lights will go, so that the house is dry (and it makes a difference—in the wet, the nice new clean concrete slab got covered with a layer of mud from boots walking on to it from outside which, as mentioned earlier, had become a quagmire. That has dried off and we have now been discussing how best to clean it—which it has to be before it can be tiled.) The studs have all gone in downstairs and upstairs. We’ve suddenly been put to work—the wood for the bargeboards and fascias arrived and needed painting. These have been done with barn paint—one coat on the side that won’t be seen, two coats on the outer face. And some have been put up. 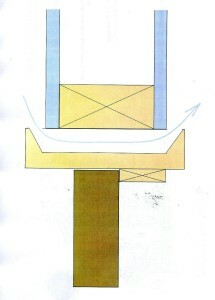 It’s a variant of an Akvaterm Solar Plus but with removable coils. Unfortunately, the packaging for this large, heavy tank is inadequate, so it has arrived with several dents and scrapes, 3 of which are quite noticeable. We’re discussing what to do about this. If you bought a fridge freezer, let alone a car, would you accept it with dings? I think not. Should I accept this, costing nearly 10 times as much—nearly as much as a cheap car. Not that it’ll be seen much in the control room. Hmm. I certainly think Akvaterm ought to crate them as routine. A bit of cardboard and plastic is laughable. There was a day or two when the house briefly looked like something from the set of The Magnificent Seven—the pieces of cladding sticking out stepwise at the gable ends. 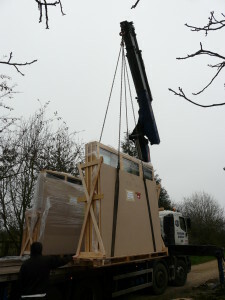 As more is put into place it reverts to a brown cardboard box. We were reminded of converting the boxes from TVs or other large equipment into playhouses for the children. The snow came at the weekend—as forecast. Rather more snow than expected—nearer 15cm than 10, I’d say, such that the car was tending to “snow-plough” down the drive. Any deeper and we would not have been able to get out. Following this, the weather has continued cold but dry. Despite this work has continued and we do admire the builders for pushing on in these conditions. You can now begin to see where the upstairs roof lights are to go—the apertures are clear, now that the jack rafters have been put in place. The lights are quite large, with 5 on the north roof, giving light to the two upstairs bathrooms and 3 over the stairwell and landing, all triple glazed. The calculations show that, to have them on the south roof, the house would risk getting too hot. There’s one, in the upstairs study, that does face south and we are to have an external blind to provide shade on summer days to stop the room overheating. To meet safety escape requirements, this is top hung—so that you can climb out on to the roof in case of fire (the others are centre hung) but, presumably because of the weight, this one is only double glazed. The second storey, under roof goes up. Better weather this week, with the last few days very cold but sunny and clear. The quagmire created by the forklift is frozen hard which makes moving around the site much easier and on the Thursday and Friday the wind drops, making (almost) ideal working conditions. The huge glulam ridge beam is lifted in, in three sections. 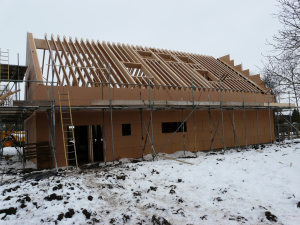 Many rafters follow quickly, so that by the end of the week the shape of the house is is becoming clear. Curiously, with the beam in place, the size of the house is contained. Much of the groung floor has the external, air-tight cladding in place now and this view the spaces for the large south facing windows. They have had a really rotten week, last week, with the second half being really cold and wet—quite miserable. This photo, taken in the middle of this week shows how well they’ve got on and the weather’s better at the moment. It’s bad for one’s ego—every piece of wood has literally got my name on it: TWH Learmonth – and code numbers. 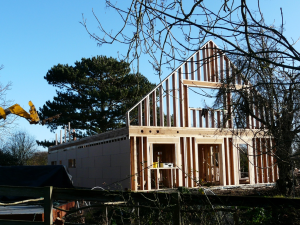 The TWH is for Touchwood Homes, the main builder and the originator of this particular building technique. The I-beams are assembled from finger-jointed studs, about 2” by 2” (OK, 50 by 50mm) joined with a web that looks like hardboard or OSB (Oriented Strand board), but isn’t. It’s made, I’m told, from wood fibres compressed under such force that the cellulose and lignin in the wood fibres glue themselves together. This means that there is no glue and therefore no out-gassing of the glue materials such as formaldehyde. If you expand the picture you may be able to see that the dimensions given are 45 x 360mm for these rafters. 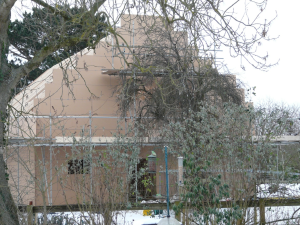 The gable ends go up on Thursday—the house looks enormous.